One thing I hate about eyeliner is when it pulls against your eyes when applying (and actually really hurts!) My latest quest has been for the perfect, long-lasting, black eyeliner that glides on really easily and doesn't tug or pull. Welcome Avon SuperShock Gel Eyeliner Pencil! Before I even tried comparisons and tested longevity I was sold purely on how smooth the application was, glides on really easily, doesn't pull the skin and has, as the name would suggest, a gel texture. Above is Avon SuperShock Gel Eyeliner verses Mac Eye Khol in Smoulder. When first applied, after three hours, and after five hours. When first applied I really had to build the Mac pencil to get a colour whereas just a couple of sweeps of Avon was enough! After three hours the Avon pencil had lifted a little but not as significantly as the Mac & after 5 hours the Avon had hardly lifted anymore whereas Mac was hardly visible. 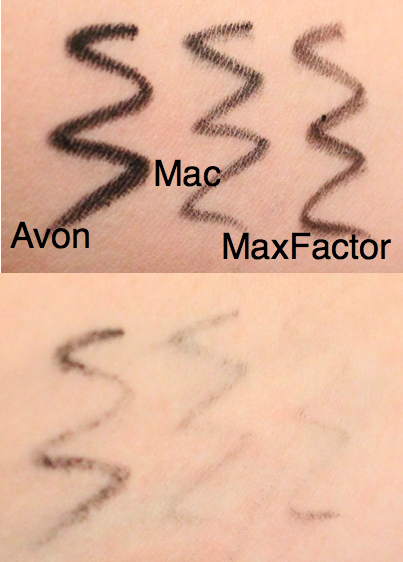 To test out the colour pigment I then compared Avon SuperShock Gel Eyeliner with Mac Smoulder Eye Khol and MaxFactor Khol Kajal in 20 Black (below), the Avon was the clear winner as it was the deepest shade of black and after 3 swipes of my Bioderma makeup remover it was the strongest left! Most importantly at £4.00 (normally 6 but currently on sale!) is a total bargain! Especially when you compare to Mac, which is more than three times the price at £14.00 and MaxFactor £4.99. I loved this so much I even bought another colour in the shade Blackberry!